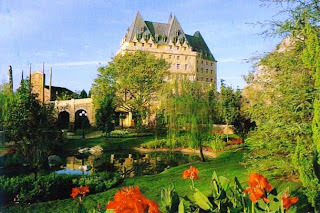 The Canada Pavilion in World Showcase has always had a totem pole, as you can see on the far left of this 1982 postcard. 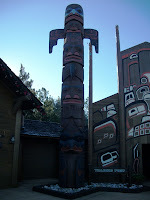 Just one totem pole, however, was not enough for the pavilion and, in 1998, another totem pole was planned as an addition. Unlike the magical Christmas trees around Walt Disney World, this carving wasn’t just assembled and placed on stage in the Canada Pavilion overnight. Instead, Imagineers brought in artist David Boxley to create the totem onstage in front of guests. Guests were not only able to watch this breathtaking piece take form, but they were able to learn about the specifics of the art form, its traditions, and the totems’ history. I was a Canadian cast member working in the pavilion when this was going on. That totem was not an addition but a replacement. There are a few totems in the pavilion (3 I think) but only one of them wooden. The wooden one rotted out I guess so the commissioned a replacement.